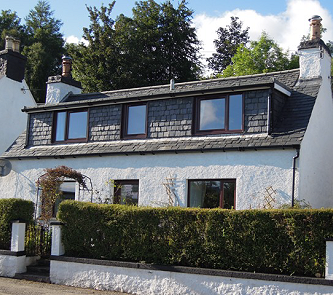 Shamrock Cottage is a traditional detached stone cottage with 3 bedrooms sleeping 6 set in the picturesque and tranquil village of Lochcarron in North West of Scotland, along the North Coast 500 route which makes it an ideal base to explore the area. Lochcarron lies among some of Scotland's finest scenery. It is ideally located to explore the West Highlands and the Isle of Skye. Eilean Donan Castle, Plockton and Applecross (reached via a spectacular drive over Britain’s highest road pass) are nearby as are the mountain ranges of Torridon, the 5 sisters and Cuillins on Skye. Shamrock Cottage is conveniently located in the village itself close to the shinty pitch, where in season it is free to support the village side who play every second Saturday. The cottage is within easy walking distance of the shops and local restaurants and pub. Visitors enjoy the convenience of being able to walk along the shore front to the shops for the paper in the morning and eat out in the evening without having to take the car.